Marilyn Monroe’s glamorous legacy and engaging personality provide the inspiration behind Marilyn Monroe Spas (www.MarilynMonroeSpas.com), which boast three distinct spa and salon concepts: Marilyn Monroe Nail Boutiques (manicure, pedicure, and waxing services), Marilyn Monroe Glamour Rooms (hair, nails, makeup, and select spa services), and Marilyn Monroe Spas (full service resort/luxury spas). The Marilyn Monroe Spas brand nail polishes are vegan, cruelty-free, and three-free. Other Marilyn Monroe Spas products used in the Nail Boutiques are made with certified natural organic ingredients and support global fair trade farming and sustainability practices. 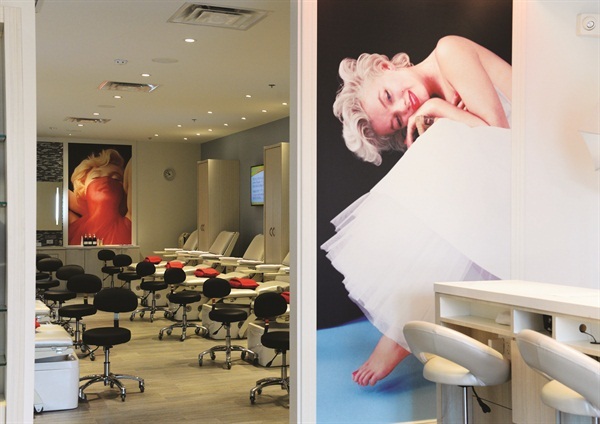 The Nail Boutiques also feature a custom-designed “nap-and-nail” chair where the client may relax and have both her manicure and pedicure done in one very comfortable, reclining seat.